Mark Twain once observed, “Many a small thing has been made large by the right kind of advertising”. One need only turn to the trusty internet to find examples of where the right advertising has made a dramatic impact on mass consumerism. In a world of technology where advertising banners adorn the web pages we frequent, there is still surprisingly a place for the impact of billboard or outdoor advertising. Indeed if anything, advances in technology have made this advertising medium of the previous century, well and truly a thing of the 21st century. 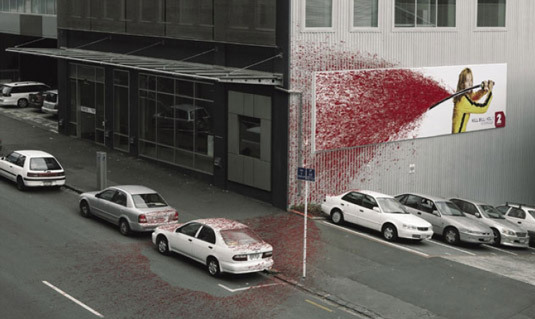 Take the billboard advertising for Kill Bill for example produced by Saatchi in Auckland, New Zealand. To make an impact on the admiring public, the outdoor advertising stunt featured a canary-suited Uma Thurman with her iconic Hattori Hanzo, from which spattered a scarlet waterfall of ‘blood’ which consumed the wall, pavement and three aptly parked white cars. This dramatic and clever design left the consumer in no doubt as to what the storyline was. But outdoor media isn’t just about advertising products for the purpose of mass consumerism. They can even create an impact and challenge the observer. Take the Australian Childhood Foundations advertising campaign to raise awareness of neglect as a form of childhood abuse. 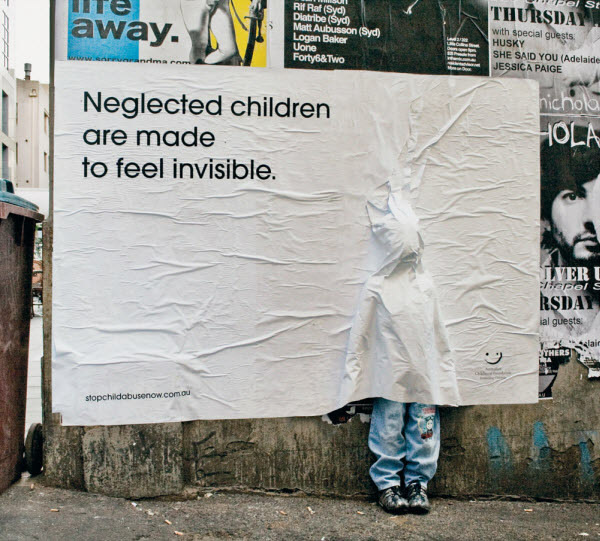 These giant white posters incorporated the papering over of a child sized mannequin, leaving only the calves and feet of the ‘child’ visible, bearing the succinct slogan, “Neglected children are made to feel invisible”. This simplistic yet powerful marriage of ideas between the Foundation and their media company JWT, made a significant impact on the public and won its designers an award at Cannes Outdoor Lions in 2010. Moreover it enabled the Foundation to get a stark and powerful message over to the people of Australia. Billboard advertising is not just something therefore that can adorn the side of a motorway or freeway. It is a powerful outdoor media communication device, providing big businesses and public services to convey either a sense of what their product is about or create a thought-provoking image which could have a galvanising effect on their observer. David Oglivy argues, “It takes a big idea to attract the attention of consumers and get them to buy your product. Unless your advertising contains a big idea, it will pass like a ship in the night. I doubt if more than one campaign in a hundred contains a big idea”. However, that is where outdoor media and billboard advertising can create more of an impact than its rival – internet based media. Again turn to prior examples of effective outdoor advertising campaigns for perfect examples of this. A captivating and creative billboard can quite literally stop you in your tracks or quite the opposite promote a reaction. Think the Nike and PSP ‘transparent’ billboards and the Art Everywhere campaign promoting British Art back in Summer 2013. Outdoor media advertising has not lost its impact, even today in the 21st century.